First of all a very big “thank you” to all who attended the patchwork retreat in Glendalough. It was great fun and I really enjoyed it. It was great meeting new and old friends, you were all so lovely and got on very well together. Some people made the same quilt but they all had their own personalities. 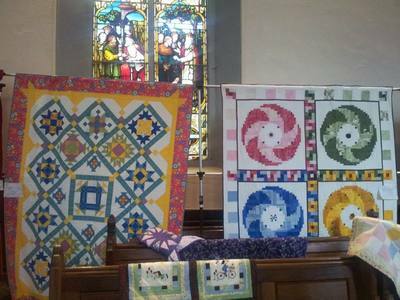 We would love to see the finished quilts. 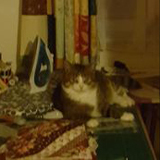 While I was away the cat could play…………..in my sewing room! That reminds me that last year we had family home for Christmas ( I love to see them) so in the preparation my sewing room was filled with junk. So when they left a major clearout was needed. The (tiny) room was first emptied and painted white and my new SewEzi table installed to hold my good friend the Bernina. The machine is about 16 years old and I love it. Every time I sit to sew I hope it will last forever. 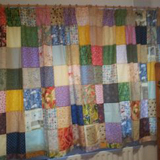 I found lots of left over fabrics and cut them into 8″ squares, sewed them together and made curtains. They really brighten the room and I have lots of reminders of previous quilts. My sewing machine was also given a present of a new cover. I can now go in there, put on a favourite CD and sew for hours. I usually like to sew to 60’s music, it would be interesting to know what others like to sew by? ​On a different note, this week I attended a Special Olympics ladies basketball match between Lakers and Killester. The players all played very well and win or lose they enjoyed it, supported each other and kept smiling. It is always wonderful to watch the ABILITIES of such amazing people. Tonight we are going to the Mermaid theatre in Bray to watch Laker’s annual concert. We have been going for many years and if you want to be uplifted and have great fun then that is the place to be. The talent is brilliant and gets better each time. All the coaches and helpers need a huge ‘thank you’. I’m hopping again…. we have a plaque in the shop that says “There are no Mistakes”. I love this as what we do is all a learning curve and “mistakes” can always be turned into something else if we really cannot stand them. Nothing needs to be perfect – others usually don’t notice and we are our own biggest critics. I am sure many of you know this but we were told it and like to pass it on…. when joining strips of fabric together lengthwise sew the first two together left to right and add the next strip from right to left. Continue in this alternate way to end up with a straight piece of fabric. If all the strips are sewn from the same end they will fan out. It doesn’t make sense to me but I have seen it happen. Why is it that half square triangles end up at different sizes even though great care is taken to keep them the same? I start mine off bigger than needed and cut them down so that they are all the same size. I am trying to design a new pattern, will see if it works! I am about to chop up a panel I don’t like much and insert other bits. It will either kill or cure it….will let you know. 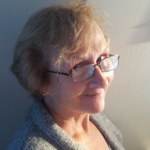 Marie O'Mahoney is an artist, quilter, quilt shop owner, mother to 5 and nanny to 4 squishy adorable monsters.